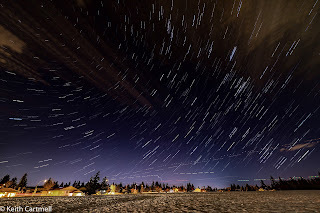 Last night was another astro night, as you may have gathered from the photo. I learned a new thing. Two things, actually, and I'm going to write about them to help me remember them. Whether it's new, or interesting, or useful to you is another thing entirely. YMMV and all. My camera, like many others, lets you get all set up, press a button, then it will click away till it runs out of battery or memory card. So far so good. It also has a function where you can set a specific number of shots, and that's what I tried last night. Except it didn't. See that space in the arc of the stars? That's the camera stopping a whole lot sooner than expected, and me figuring out what happened. Eventually I got it going the same way I did a few nights ago. Turns out that 'interval time' is not the time from the end of one shot to the beginning of the next. No, it's the time from the beginning of one shot to the beginning of the next. I was trying an 8 second exposure, with 3 seconds between shots, or so I thought. What actually happens is the camera starts the first shot, counts to 3 seconds, and can't take a shot because it's already taking a shot, so it counts another 3 seconds, still shooting, another 3, and it's finally able to take another shot. It does so, and the little counter thinks it's taken 4 shots. Your nicely planned sequence of shots isn't happening. 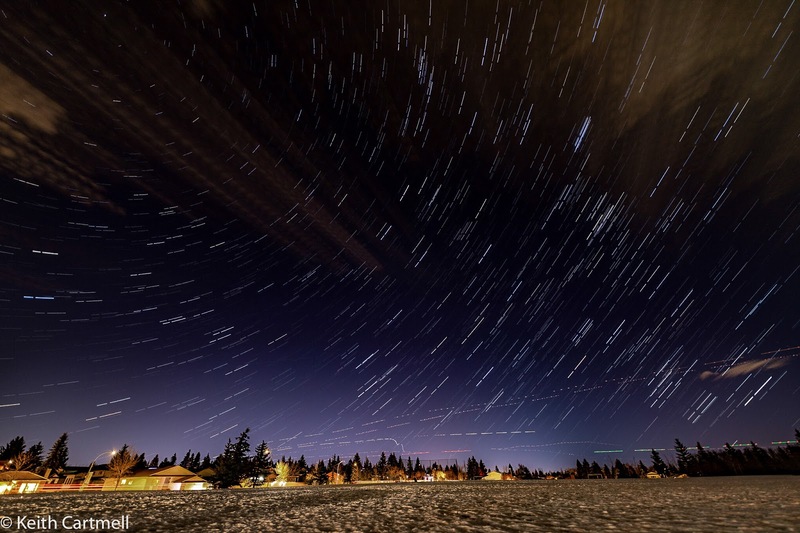 If you want a nice star trail, you want the minimum time between shots. Just long enough to write the data to the card, in fact. So what I'll do next time is figure out my exposure time (probably between 5 and 15 seconds) depending on circumstances. Then I'll add a second or two, and make that my interval time. Easy peasy, once you know. The other thing. Back button focus. I'd read about this a while ago, but it didn't really sink in, and the instructions to set it up sounded a little arcane. What the people that write the manual call various functions hurts my brain. But after my night shoots where I'm playing with focus and exposure and composition, all while not dropping the camera into a puddle, I understand why you'd want to do this. It separates the focus function from taking the shot. An example. The camera is mounted on a tripod. It's -10C so you're wearing gloves. Twiddling the tripod head while peering through your viewfinder to set up your composition is mostly ok. But things are probably out of focus. So you touch the shutter button to give that half press so you can see exactly where the edge of the building is in relation to the edge of the frame and if the image is level. Except, oops, click, and the camera is recording the scene. If it's night, it might be a fairly long wait till the exposure is done. If you're bracketing it might be 10 seconds for the first shot, 5 for the second, and 20 for the third. That's a really long time when it's cold and you're impatient to get on with it. Normally I just swear to myself and wait, but you might remember I did one where I played with it, here. But now there's a separate button for focus. Twiddle with the tripod head for composition, and press the focus button. Refine things and check focus again if required. Then take your shot(s) knowing that the camera autofocus isn't going to mess you up. Even better, as long as you're shooting something the same distance away, plus or minus your depth of field, you don't need to do anything but press the shutter button. No fancy pants camera refocussing happening. Even better, imagine you are a high paid sports photographer. Your subject moves more than your depth of field so one focus setting doesn't work. If you hold the focus button down it tracks your moving subject, while you fire as many shots as your camera will let you. I tried it this morning with a bus at 50KPH, shooting through trees. The shots are banal, so I won't bore you with them. I took 16 shots in 3 seconds, at a slow 1/60, (this was between sunrise shots) with the camera ignoring the closer trees. The bus isn't perfectly in focus due to the combination of it's speed and the slow shutter speed, but the trees are blurred much more, so it's working. One last thing. I've missed many shots because it was dark and the autofocus didn't work. This way it takes the shot without checking focus, which might be a good or bad thing. But if you've set up properly, you can shoot nearly in the dark, say at a kids halloween party, and get shots that can be brightened up in post production. At first it seems a little weird, but after a few dozen photos this morning it's becoming more natural. That photo, since you asked. No I'm not out in the boonies. I'm in the green space across the road, trying to capture the various aircraft heading to and from the airport. I've got some ideas I want to explore on that topic. Settings are 103 shots in StarStax, f1.8, 6 seconds, ISO 100, (yes, 100, not 1,000) and yes, I know you want this lens. From the famous Neil Zeller himself! "Great blog. I'd never set any gap between the shots at night. It's why I use a simple cable switch. The lesson is perfect for daytime timelapse though. Shoot clouds going over, and your shutter speed would be 1/500 and shooting back to back wouldn't make any sense. a 15-30 interval would be great. Great work!"